The houses only come in one size Lynx! But like I mentioned in the email, I was leaving the top only half sewn for the extra head and tail feathers room. Without the top, Clover, our 22lb dog, can curl up into a ball in one, she's to tall with a top on of course. Getting it boxed up and ready to go for the mailman. Oh, it's so pretty! I bet she will like it!! I have in mind using some material I have around here for exchangeable pads (that I can wash). I do think it will be big enough for her. I thought that print would be fitting, glad you like it. Hope she will to! Can't wait to she what she thinks. Is the outside fleece as well? I have a cash-flow challenge for the next month or so - but the Yurt is on my wish list! 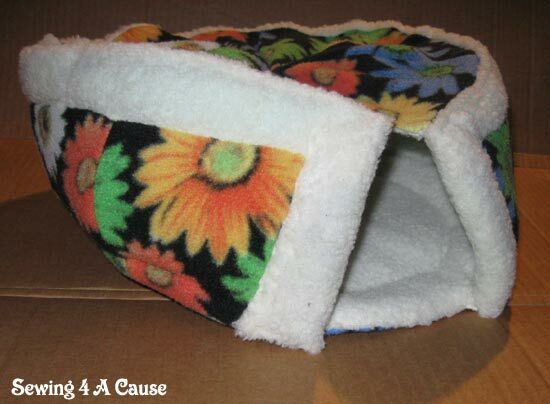 Jacqueline - The Yurt houses are normally made with cotton & fleece, but all fleece is doable as well. Although, I did find I will have to make a concession for all fleece after making Lynx's. 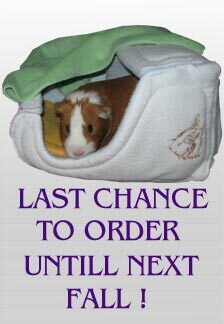 That fleece/fleece houses will have to be anti-pill or polar fleeces only. Houses with cotton/fleece can be any of the fleeces like the sherpa used thus far. 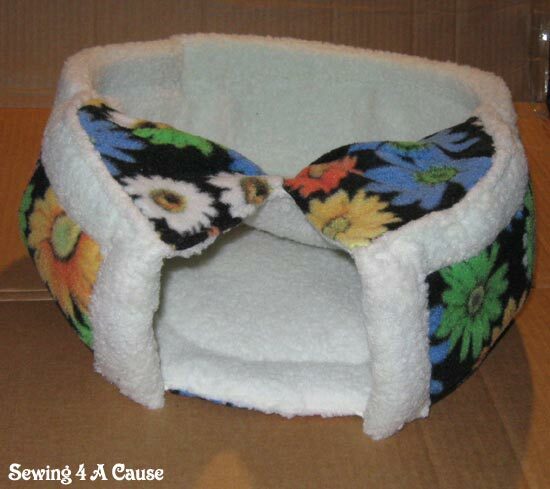 This should be a good cold weather bed for Mia. And since molting (losing all the feathers) often happens in the cold, I'm sure it will be especially appreciated in coming winters too. Oh, I hope you'll take pictures, lynx! It arrived! And it is so absolutely adorable! (pictures don't do it justice) Such a wonderful, cushy and stylish house!! Not to mention sturdy and well made! I like how the top of the top part is made in triangles (very cool!). And I can see (due to the thickness), why it might have been tricky using the sherpa and fleece but it does make for a deluxe Yurt! If any of you haven't tried one of WindeSpirit's wonderful houses, you really should!! There is definitely enough lateral/horizontal room for Mia though I may need to make some adjustments so she can get in more easily. But I am sure one way or another, it will be a warm place for her in the winter and an especially welcome, warm place if it is cold and she's lost a bunch of feathers! Thanks so much, Windespirit! I hope to have a picture of Mia happy inside within the next few days! Mia is snugged in for the night! She wandered around a while but finally stepped in. I doubt any chicken 'round these parts has as comfy a bed! I have this sweet image in my head now of a chicken (Mia) snuggling in the Yurt. Very cute! I really hope you'll post pictures on the chicken thread! The biggest problem is it is dark when she gets in the bed and pictures won't be very good. I will try though! So happy your yurt house arrived swiftly Lynx! High praise coming from you, thank you, I try and make things worthy, weather it's for paws, hooves, or feathers. I was hoping with the back top half open she'd be able to use that to get the head clearance she needs and use the top as a blanket. Not sure if she would figure that out or not, but I'm sure you both will adjust as you need. Indeed, even chickens enjoy a soft warm bed. Yurt Houses are on sale this February, $3.00 off! Beatriz is staying warm in hers today, smart girl. Oh, No! I didn't realize your things were seasonal! Is the Yurt just for the winter as well? A few things are seasonal Jacqueline, and yes, the Yurt house will be also. The Yurt is cozy! I would say it is a winter thing! Going to get in the single digits in a few days. I am betting Mia is going to be VERY happy she has her Yurt!